Here’s my favorite vegan protein powder. I used to take a whey protein that I also liked:) But, I changed it up because the whey contains dairy and sometimes dairy doesn’t sit that well with my stomach. Suppresses the hunger hormone, ghrelin to keep me full!! 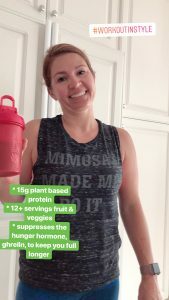 I have used the greens by this company for 4+ years and love them too!! I like the chocolate flavor best:) But the vanilla isn’t bad if you are going to add some fruit or other flavors. I add the protein to 8 oz of water in a shaker and a couple ice cubes and shake!! I like to drink it as breakfast or an after workout snack. Sometimes I add a teaspoon of coconut oil too, it helps creamier. To Simplify Being Healthy On The Go.. There's no reason to feel deprived as a diabetic. Grab your 11 Grab and Go Snack ideas that will make snacking enjoyable again! Charlie Allred is a type 1 diabetic for the last 15 years. She believes in living her healthiest life and seeing Diabetes as a blessing to compel her to live her best life! I consent to Healthy Diabetic collecting my details through this form.